LIVERPOOL SHIPS The SAXONIA and the IVERNIA were the first two new ships built for the Cunard Line's Canadian services in the early 1950s. 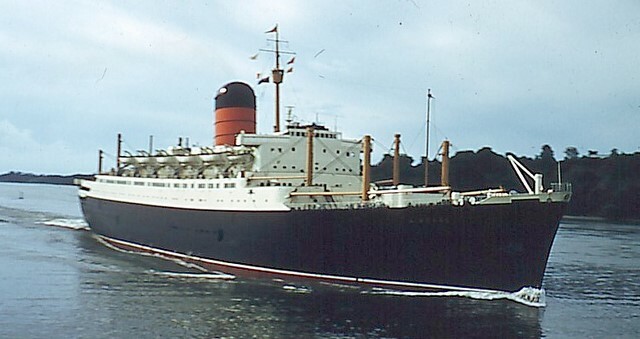 The SAXONIA and the IVERNIA were the first two new ships built for the Cunard Line's Canadian services in the early 1950s. They were later followed by the CARINTHIA and the SYLVANIA. The SAXONIA and the IVERNIA only spent a very short time based at Liverpool, but nevertheless they both warrant inclusion in this 'Liverpool Ships' website. 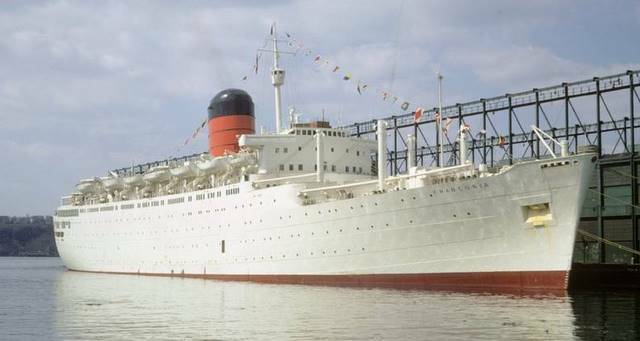 In the case of the SAXONIA, she was Liverpool-based from her maiden voyage on 2nd September 1954 until she moved south to Southampton on 19th June 1956. 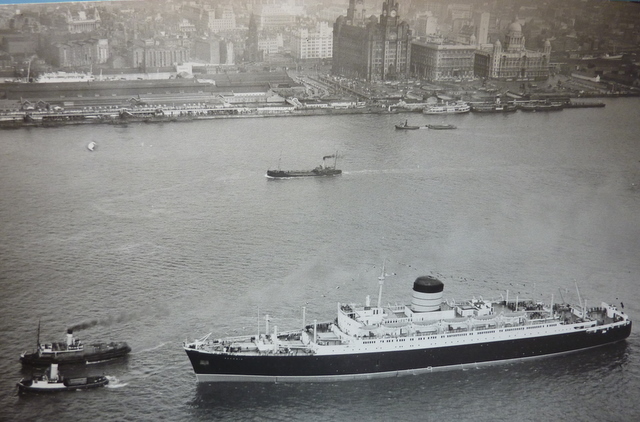 As for the IVERNIA, she was based at Liverpool from July 1955 until April 1957. "The wooing of the tourist classes is continued in the new Cunarder, the SAXONIA, which set off on her maiden voyage to Canada last Thursday (2nd September 1954). Not only do tourist-class passengers outnumber those travelling in first class by six to one, but their importance has been recognised, for the first time in a Cunard ship, by the appointment of a head waiter in the tourist-class restaurant. This appointment is symbolic of the company's attitude throughout to tourist-class passengers. The head waiter's sole function, as always in the past in first-class dining saloons, is to see that the passenger is contented with his food. Similarly, in other public rooms and cabins, the tourist passenger will find that the company has gone out of its way to see that he is well catered for. Indeed, there are even some advantages over first class in travelling tourist class in the SAXONIA. As they serve so many more passengers, the tourist public rooms are much more numerous and spacious, whereas the first-class apartments, while more extravagantly furnished, are naturally somewhat small by comparison." Although no doubt the Cunard Line would disclaim any intention of setting up records, the fact that the SAXONIA on her maiden eastbound crossing from Montreal to Liverpool completed the passage in the fastest time yet, must have been gratifying to them. To accomplish the passage from the St Lawrence pilot station at Father Point, Quebec, to the Mersey Bar Lightship in less than five days was an achievement worthy of congratulations to all associated with the ship. On her record-breaking eastbound passage the SAXONIA encountered continuous north-westerly gales. Her Denny-Brown stabilisers reduced the rolling to less than two degrees, a circumstance naturally appreciated by her passengers. The SAXONIA had one of the largest end-of-season passenger lists ever known and reached Liverpool at the end of her maiden voyage nearly nine hours ahead of her original schedule. On the basis of an estimated speed of 19 knots, the SAXONIA was not expected to berth at Princes Landing Stage until Tuesday evening 21st September. Her master, Captain Andrew MacKellar, however, found that despite the rough seas and heavy swell encountered, his new ship was capable of almost another two knots. Consequently the SAXONIA was off the Mersey Bar at 4.30am and alongside the landing stage by 9.am. Passengers whom the Cunard company had expected it would have to accommodate on board overnight to await trains the following day were instead in London in time for tea. The boat train from Riverside Railway Station at Liverpool, with 372 London-bound passengers, was the largest civilian train handled since the war. The SAXONIA left Father Point, the St Lawrence pilot station, at 3.06am on 16th September 1954 and arrived at the Liverpool Bar Light Vessel at 7.30.am on 21st September. The new liner covered the 2,464 nautical miles at an average speed of 20.74 knots in four days, twenty-three hours and twenty-four minutes. Although the Cunard Line claim this crossing only as a record for its own ships, it is believed that the previous fastest time for the passage was five days and five hours. Captain MacKellar was obviously delighted with his new command. "She is a very fine ship in all ways," he said. "A particular asset for the St Lawrence river passage is her ready response to the helm. All her many mechanical devices worked according to plan, the stabilisers being particularly effective." 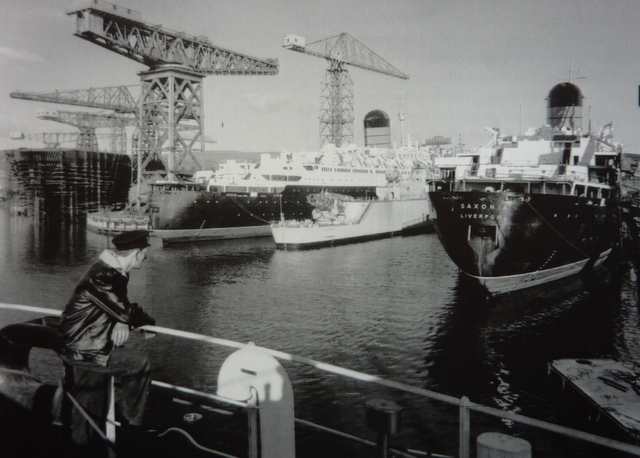 The IVERNIA followed the SAXONIA down the slipway at John Brown's yard at Clydebank ten months later on 14th December 1954. 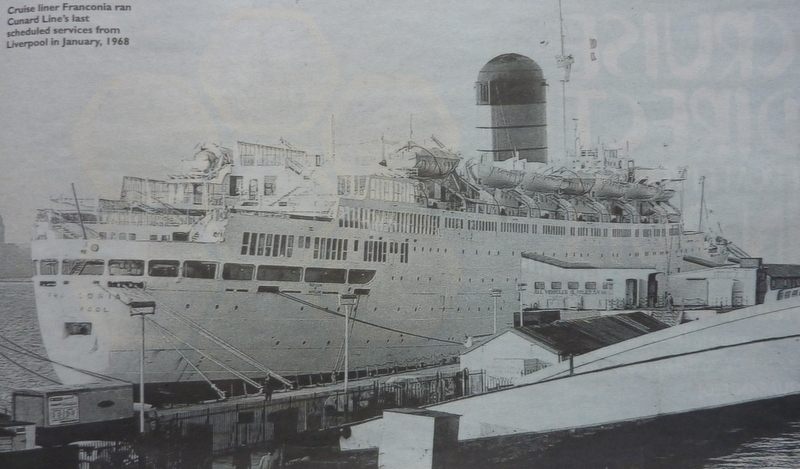 Her short stay based at Liverpool was uneventful, except for the fact that her maiden voyage commenced at Greenock on 1st July 1955 due to the fact that Liverpool was, once again, in the grip of a bout of industrial unrest. Towards the end of the 1950s with air travel across the North Atlantic on the increase, especially in the winter months, Cunard was having problems profitably employing the four 20,000-ton liners which were basically emigrant carriers. 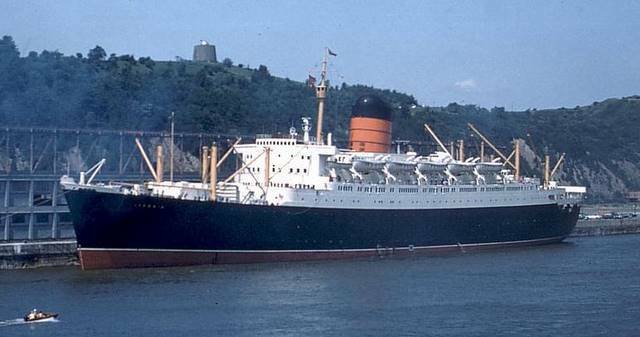 Unlike the new Canadian Pacific ships, the Cunarders were not suitable for cruising, and so at the end of the 1962 St Lawrence season the SAXONIA and the IVERNIA were sent back to their builders for a major refit which would make them suitable for winter cruising. for a complete re-build over the winter of 1962-63. On 1st January 1963 the SAXONIA was renamed CARMANIA, and the IVERNIA was given the new name of FRANCONIA. 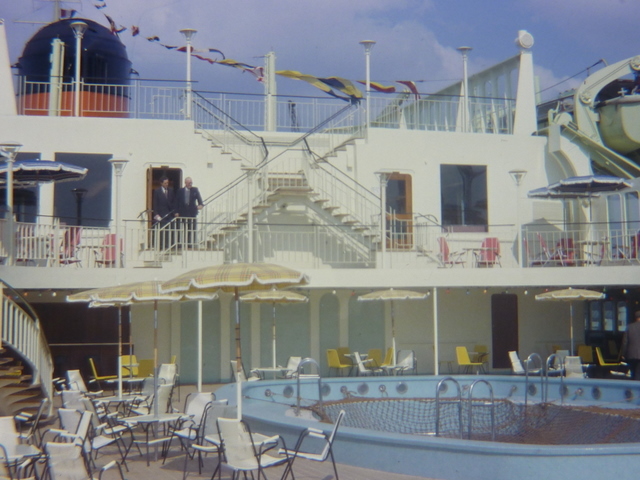 A large lido deck with swimming pool was built on to the after end of each ship; the passenger accommodation was refurbished, and the hulls were painted a 'cruising green' similar to Cunard's 'Green Goddess', the CARONIA. 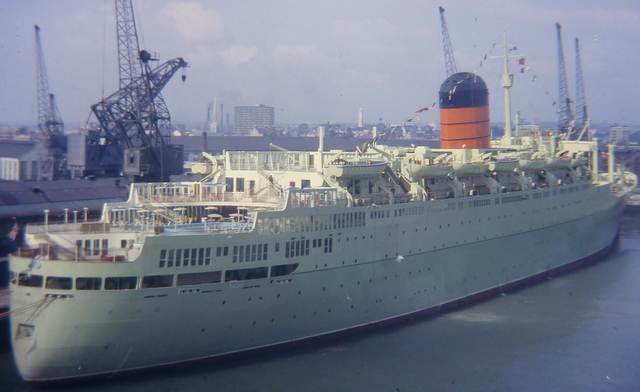 The CARMANIA at Southampton in April 1963 following her rebuild. 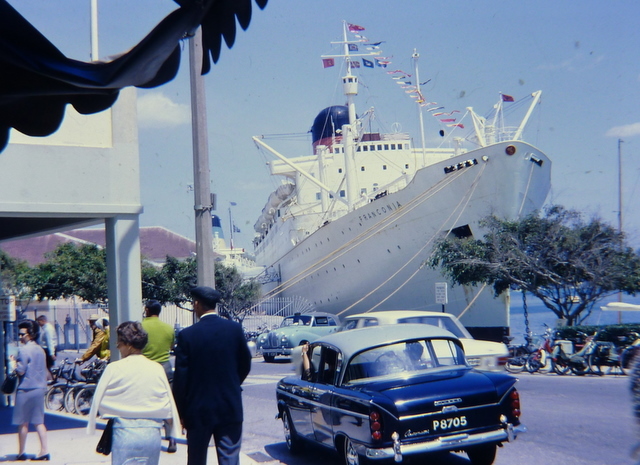 via Bermuda, closing a steamship service which had lasted 128 years. New Year cruise in January 1968. The CARMANIA and the FRANCONIA rarely visited Liverpool in the next few years. 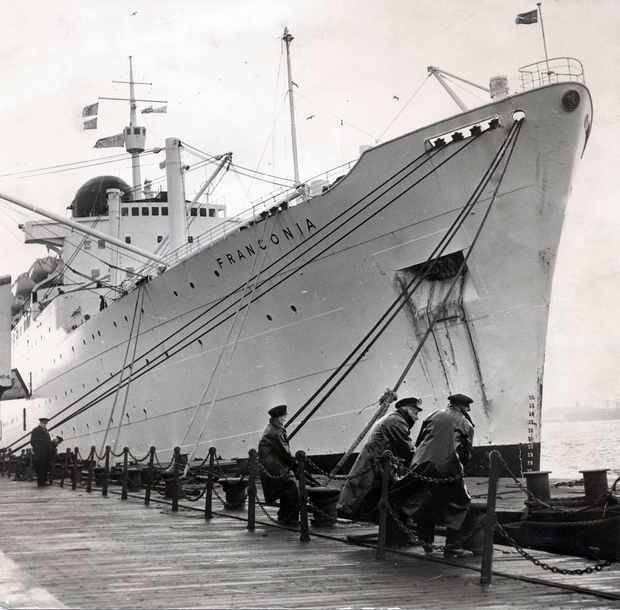 However the FRANCONIA did operate two cruises from Liverpool over Christmas 1967 and in January 1968. Following these cruises, she was overhauled in the port, and on 30th January 1968 the FRANCONIA had the dubious distinction of leaving Liverpool at 2.pm on the Cunard Line's last ever scheduled trans-Atlantic crossing to New York from the port, finally closing a service which had started 128 years previously with the departure of the BRITANNIA on [American] Independence Day, 1840. The occasion was played down in the local press and only very few people were present on the landing stage to witness another significant event in the terminal decline of Liverpool as a passenger port. on the Cunard Line's final scheduled trans-Atlantic sailing from the port. 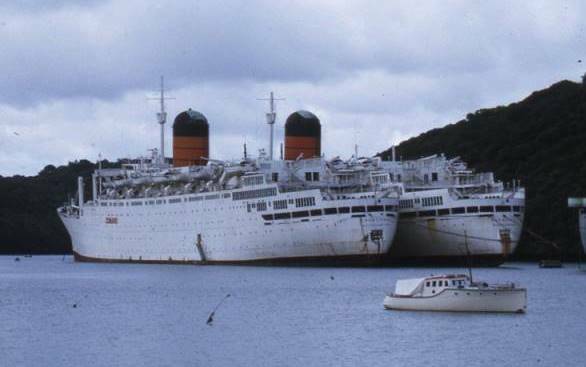 The CARMANIA and FRANCONIA were both laid up in 1971 as a result of escalating operating costs, initially at Southampton and then in the River Fal. In August 1973 the two sisters were acquired by the Nikreis Maritime Corporation of Panama, acting as agents for the Russian Sovtorflot Organisation. 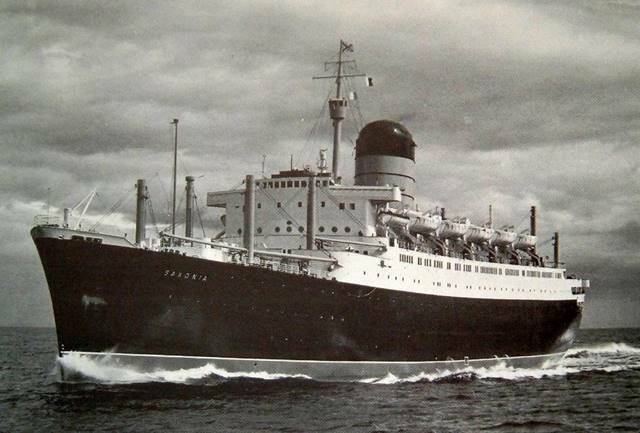 After a three month overhaul, the CARMANIA was renamed LEONID SOBINOV, and the FRANCONIA became the FEDOR SHALYAPIN. 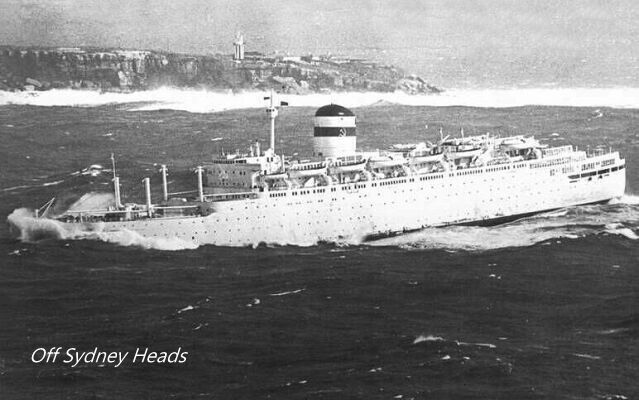 The ships retained their outward appearance and were instantly recognisable as the former Cunarders right up to the end of their careers. off Sydney Heads in heavy seas. 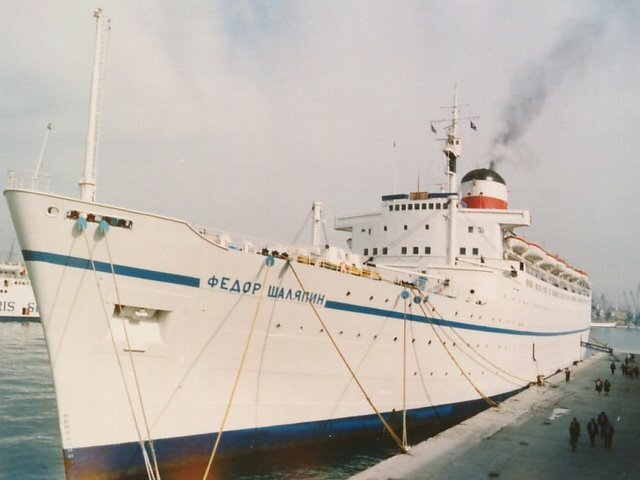 Both ships continued to operate for their Russian owners until the mid 1990s when stringent new SOLAS regulations would have required massive expenditure to bring them up to compliance. The LEONID SOBINOV (ex CARMANIA) left Odessa on 30th January 1999 under her own steam bound for the shipbreakers at Alang, India. On passage she suffered the indignity of running out of fuel and was left drifting in the Indian Ocean until she was retrieved by two tugs. 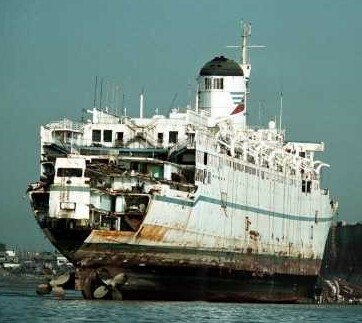 The former SAXONIA was dragged ashore at Alang on 1st October 1999 and demolition commenced. Auckland, New Zealand, sailing under the Russian flag.